Going in to work early means I get off work early. J needed to go grocery shopping, but I told her to just wait until I got home and I would go with her. Before we left for Meijer though, I decided to put in an order for pizza. We’re running out of new pizza joints in Kalamazoo, but there is one that I’ve had good experiences with in the past at other universities. Gumby’s Pizza is on Stadium Drive in the shopping center near Adios Drive. 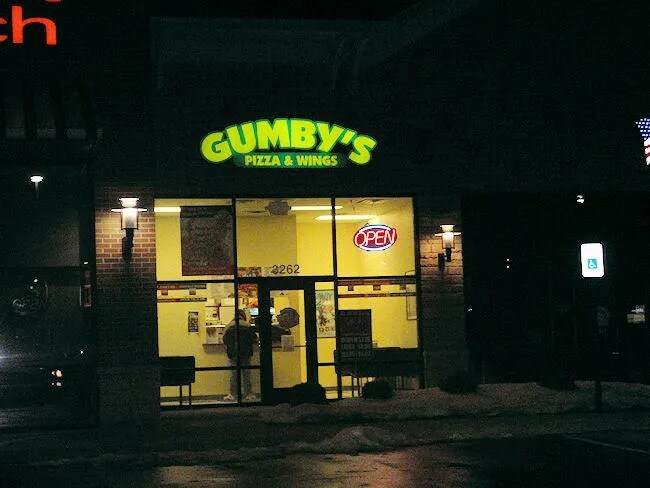 Gumby’s mainly has locations on or near college campus’s which is how I’ve had past experiences with them. I had friends that went to the University of Illinois in Champaign, IL. 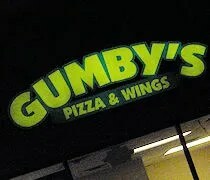 Gumby’s was the delivery place of choice. I also ordered from a Gumby’s once when we lived in Lansing. There is a location near Michigan State on Grand River Avenue. I decided to use the online ordering feature on Gumby’s website. I would always prefer to order online than to call in an order. It’s just easier. Pizza places are always swamped with calls and they try to get you off the phone as quickly as possible. I don’t blame them for that, but by ordering online, I can take my time when it comes to decision making. I put in an order at 6:45 for a medium bacon pizza and a small order of Pokey Sticks. I set it up so my pizza would be ready by 8:00. J and I went to Meijer and did our grocery shopping. We headed over to Gumby’s to pick up the pizza. At about 7:45, I walked in to the small pizzeria and asked for my order. It wasn’t ready yet. In fact, it hadn’t even been started yet. Since I was in the store, one of the pizza makers said they would move my order to the front of the que. The pizza didn’t actually get in my hands until about 8:10. I put the order in an hour and forty five minutes before I was going to pick it up and it still wasn’t ready on time. I had already paid online using a credit card, so when the order was ready, the clerk walked out with two boxes and handed them to me. I killed time by playing Angry Birds on my phone in their small dine in area. J was a little surprised to see such a small shop because she drives by Gumby’s every morning at 2:30 on her way to work and the place is always packed. She always assumed it was more of a sit down place than a typical carry-out/delivery pizza joint. When we got home, we resisted temptation to dive right in and first put our groceries away. When that mundane chore was over, I picked up the pizza box and cracked it open. 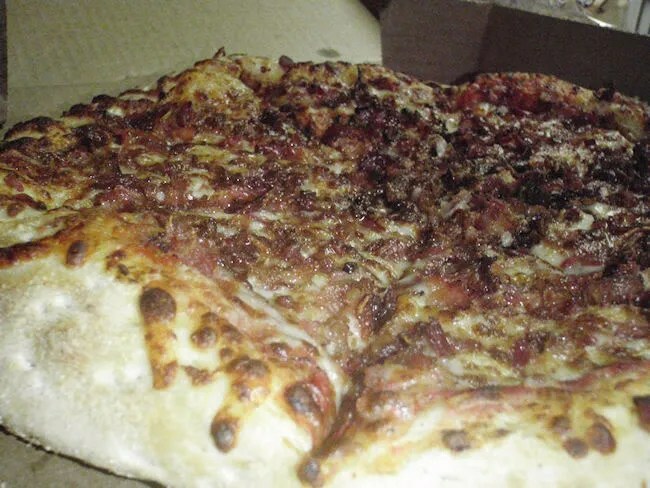 The pizza was a nice, dark golden brown color and loaded with crispy bits of bacon. The crust is typical of carry-out chains. Nothing spectacular. The pizza overall is pretty good, but again, too typical of delivery pizza. We both thought it was fine, but nothing special. From my days hanging out in Champaign, I knew the Pokey Sticks are what make Gumby’s Gumby’s. 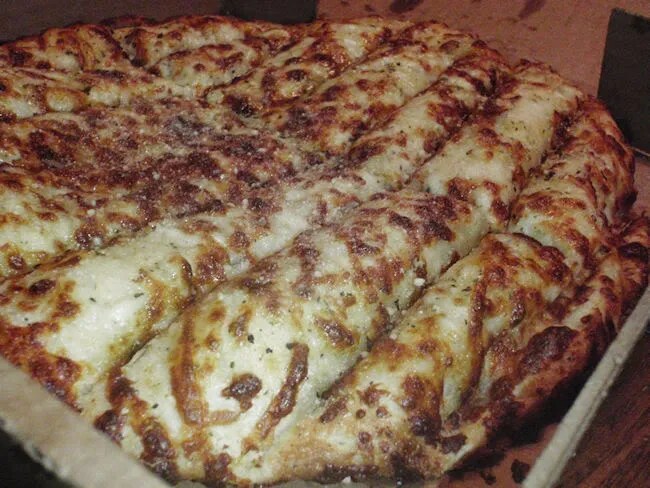 The Pokey Sticks are hand tossed pizza dough topped with garlic butter, Italian spices, mozzarella and Parmesan cheese and they are delicious. They’re a little salty from the Parmesan cheese, but they still rank up there with the best bread sticks either of us have ever had. We didn’t quite fight over them, but we were pretty close. The pizza from Gumby’s is typical delivery pizza, but the Pokey Sticks are worth the trip. In fact, the Pokey Sticks are the reason we would order pizza from Gumby’s again. It’s not bad pizza. It’s just average pizza. The Pokey Sticks, however, now that’s a different story…..